Arnab Chatterjee’s classic statement that the personal is not the private and is beyond both the private and the public---mooted more than a decade ago---comes of age in this book. Private, public being legal juridical categories have specific indicators; the absence of these---makes personal relationships like love or friendship remain outside legislation. And being beyond both the private and public law, the personal seems to generate its own ethic—Chatterjee names this--the personalytic ethic. Ethics is generally studied as the science of the good. But a personalytic ethic invites us to consider the way we encounter ethics in real life—through lies, deception, fraud and fictions: what happens when we are offered not the good or the just but a pale imitation of the good, the right or the just? What----when we meet a nonviolent non-vegetarian or when someone feigns to be a feminist or an egalitarian? This hypocritical fraud which is not captured immediately as a fraud takes us to pure political, narrative encounters painstakingly inscribed in this volume. From the phenomenon of moral blackmail, political perversion to a lonely man’s ‘terrorism’; from controversial norms, armed animal activism to poetic sociology and post-personalist social work—Chatterjee in a breathtakingly unconventional and original, ethical sweep concludes that the personal is beyond the law like the animals, and personal relationships are only possible with the animals. They can be murdered by human beings but not mastered: they slip through the net of letters—like love does. ‘Animanity’ is the new, messianic destiny—still to come. 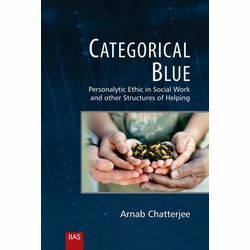 About this Book Arnab Chatterjee’s classic statement that the personal is not the private and is beyond both the private and the public---mooted more than a decade ago---comes of age in this book. Private, public being legal juridical categories have specific indicators; the absence of these---makes personal relationships like love or friendship remain outside legislation. And being beyond both the private and public law, the personal seems to generate its own ethic—Chatterjee names this--the personalytic ethic. Ethics is generally studied as the science of the good. But a personalytic ethic invites us to consider the way we encounter ethics in real life—through lies, deception, fraud and fictions: what happens when we are offered not the good or the just but a pale imitation of the good, the right or the just? What----when we meet a nonviolent non-vegetarian or when someone feigns to be a feminist or an egalitarian? This hypocritical fraud which is not captured immediately as a fraud takes us to pure political, narrative encounters painstakingly inscribed in this volume. From the phenomenon of moral blackmail, political perversion to a lonely man’s ‘terrorism’; from controversial norms, armed animal activism to poetic sociology and post-personalist social work—Chatterjee in a breathtakingly unconventional and original, ethical sweep concludes that the personal is beyond the law like the animals, and personal relationships are only possible with the animals. They can be murdered by human beings but not mastered: they slip through the net of letters—like love does. ‘Animanity’ is the new, messianic destiny—still to come.